Nature is the source of all true knowledge. She has her own logic, her own laws, she has no effect without cause nor invention without necessity. I’d like to start this article by asking you what do you know about the actuality of contemporary science? Be honest with yourself and do not get disappointed if you do not actually know much. To know little means to be in the beginning of the process of discovering. But not being interested can already be considered as a bad symptom. You might say: “But I am not really involved into sciences. Why should I know anything about the scope of life that is so far away from my everyday life?” You are wrong. This world is much closer that it seems to you. Even more, if you become aware of the news from the world where reins the creativity of mind, it will be easier for you to understand where it moves. By the way, there are projects that can be supported everyone. We’ll talk about them in the following articles. Sounds appealing? Let’s go! By this article I open a series of summary-reports about investigations, researches, discoveries and innovations that take place in our actual world nowadays. This time we are going to talk about The Nobel Prize awarded in 2017. 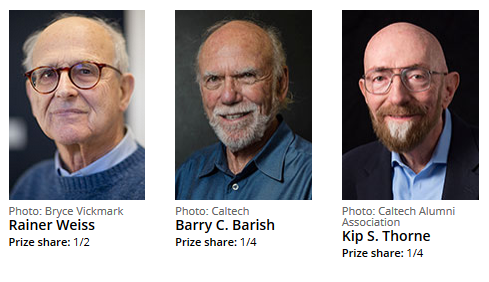 …was awarded to Rainer Weiss, Barry C. Barish and Kip S. Thorne "for decisive contributions to the LIGO detector and the observation of gravitational waves". LIGO stands for the Laser Interferometer Gravitational-Wave Observatory. It is a collaborative project with more than 1000 researchers from over 20 countries. Collectively, they have brought to reality almost a fifty-year-old vision. LIGO is not just an ordinary telescope that is used to detect light and other electromagnetic radiation deriving from space. Basically, it is an instrument purposed for catching space’s gravitational waves. Despite the gravitational waves are not sound waves but rather vibrations in spacetime itself, their frequency is similar to those we can detect with the human ears. For years, physicists have been trying to detect the gravitational waves that agitate the universe, as described by Albert Einstein a hundred years ago. As it was explained by him, space and time are malleable, and the combined four-dimensional spacetime vibrates with gravitational waves that are always created when a mass accelerate. On 14 September 2015, thanks to the LIGO detectors the world saw space vibrate with gravitational waves for the first time. The signal was utterly weak when it reached the Earth, but indeed it is a revolutionary and promising event in astrophysics. The phenomenon of gravitational waves is an entirely new approach to following the most important events in space and questioning the limits of our knowledge. We live in a world of abundancy. The Internet proliferates with tips on how to set goals correctly. If you analyze the recommendations, all of them are mostly reduced to visualization, affirmations and motivation techniques. WE UNITE UNIQUE! WE ARE N.E.O.PEOPLE! This is our communication platform, which is the LIGHTHOUSE in the “ocean” of changes in the XXI century. This is a BRIDGE, which connect the spiritual and material life. Our goal is the BALANCE between internal and external, to discover ourselves and feel the harmony in everyday life.